One of the most joyous things about summer for me is the abundance of fresh fruit. Seasonal British-grown fruits are a particular joy – that pleasure that comes from missing them when they are gone and anticipating them just before they are back once again… and then, here they are! 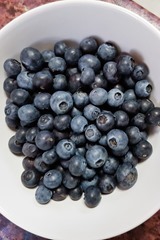 Blueberries are one such fruit but I only came to love them in recent years – their taste is much more subtle than many of the sweet bright berries I favoured as a child, not to mention the wonderfully perfumed and intense tropical fruit imported from warmer climes. Over the years I’ve become such a fan of these unassuming blue pearls. They’re lovely eaten straight from the punnet – that little squirt of juice as they pop in your mouth followed by their mild grapey taste. They’re also perfect scattered over yoghurt or muesli for breakfast, cooked into pancakes drenched in maple syrup or dropped like jewels into a baked tart or cake. Calling this recipe Blueberry Custard Ice Cream is probably a tautology, since custard is the classic base for many traditional ice cream recipes, I don’t really need to mention it… But the flavour of the custard base really comes through – the marriage of egg-enriched dairy and sweet tart blueberries making a frozen treat that puts me in mind of eating blueberries bobbing about in a bowl of custard. 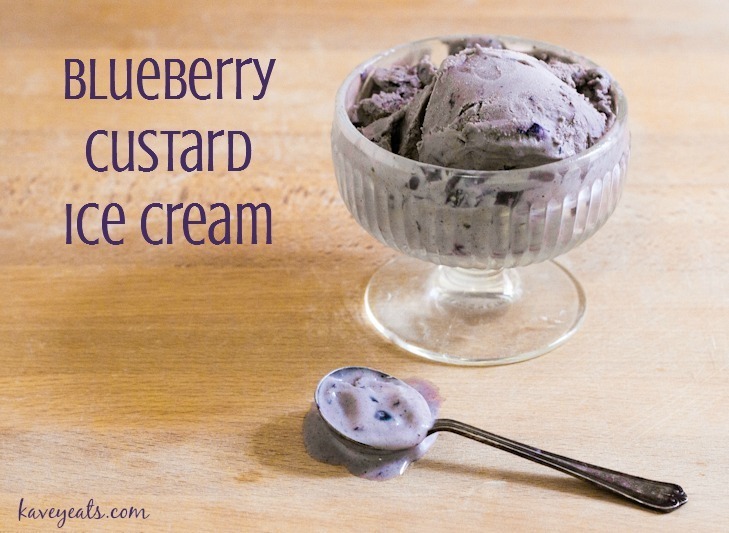 So there you are – Blueberry Custard Ice Cream! 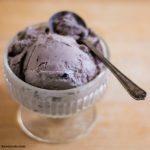 Some of the recipes I’ve seen online are illustrated with photos of vivid purple ice cream – I have no idea how they achieve so bright a colour since the recipes I’ve checked include neither food colouring nor freeze-dried blueberry powder. Fresh whole blueberries have a gorgeous purple-blue skin but the flesh inside is pale green; when blended, the resulting fruit puree is a pretty purple-burgundy but that colour is quickly muted when combined with cream or custard. The higher the ratio of fruit to cream or custard, the more intense the colour will be but if you use fresh blueberries, don’t expect really colourful ice cream. 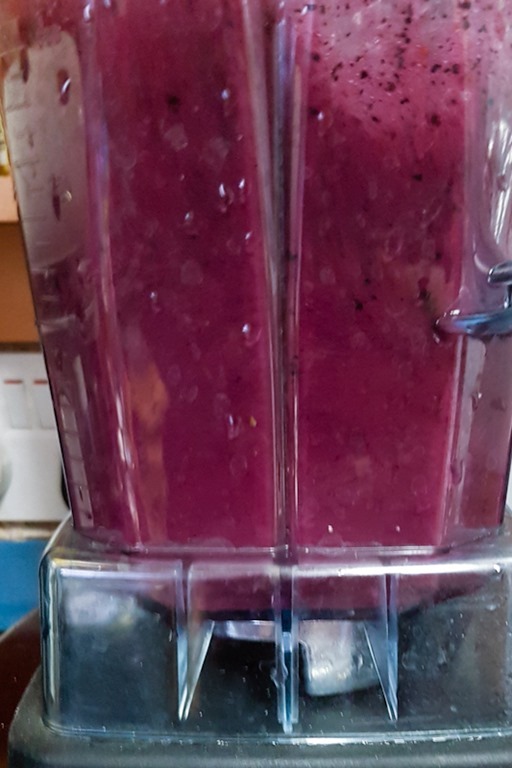 Another alternative is to substitute bilberries, a closely related berry which looks very similar to a blueberry on the outside but has purple-red flesh inside – indeed I wonder if bilberries have been used in many of the ‘blueberry’ recipes I see online? I often add a little alcohol to my ice creams to make the finished ice cream a little softer. You can omit the vodka if you prefer; in that case, add plain chopped blueberries to the ice cream when churning. I used my wonderful Froothie Optimum power blender to make the custard ice cream base so the recipe method is based on using a power blender. An alternative stove top method for making the custard is provided below. Combine all the custard ingredients (milk, cream, eggs and 60 grams sugar) in a high spec power blender, increase the speed to high and blend for several minutes. The speed of the powerful blades generates enough heat to cook the custard while continuing to mix it. Nothing catches and burns, there are no lumps and it’s very straightforward. Once the custard is cooked, transfer to a jug or bowl and set aside. Use a blender or food processor to blitz 240 grams of blueberries with 120 grams of sugar. Once blended into a smooth liquid puree, combine with the custard base and mix thoroughly. (You can either pour the custard back into the blender and blitz for a few seconds or scrape the blueberry puree into the custard and mix with a spoon). Finely chop 120 grams of blueberries and place in a small bowl. Pour two tablespoons of vodka over the chopped blueberries and set aside. Pour the blueberry custard mix into an ice cream machine – I use and recommend the Sage by Heston Blumenthal Smart Scoop – and add the chopped blueberries in vodka. They will quickly be stirred into the mixture by the churning blades. Most ice cream machines produce a fairly soft ice cream, so either serve immediately or transfer into a box and freeze until firm. Gently heat the cream, milk and half the sugar in a saucepan until it reaches boiling, then remove from the heat. Meanwhile beat the remaining sugar and egg yolks together in a large bowl. Slowly pour the hot mixture over the eggs, whisking continuously. Then pour the combined mixture back into the pan and cook gently until it thickens. Make sure you stir continuously so that the custard doesn’t catch and burn. [Now revert to step two of the instructions above]. 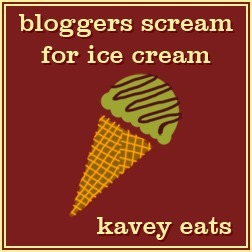 This is my recipe for August’s Bloggers Scream For Ice Cream Fruit challenge. BSFIC is open to all bloggers around the world. Whether your blog is all about food or only occasionally about food, if you publish an ice cream, sorbet, ice lolly (popsicle) or slushy recipe featuring fruit this month, click on the link and follow the instructions to join in. Special Offer: For an additional 2 years warranty free of charge on any Optimum appliance purchased, follow this link, choose your Optimum product and enter coupon code “Special Ambassador Offer” on checkout. Please see my sidebar for more information about affiliate links. Save for later on Pinterest using this handy collage pin. 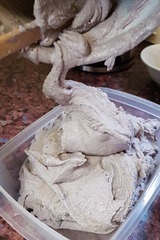 28 Comments to "Blueberry Custard Ice Cream"
I have made blueberry ice cream and as you say I have never achieved that deep purple colour either as I never add food colouring. This ice cream looks delicious. Yes, it feels a cheat to add food colouring. A friend said you can increase the depth of colour by adding freeze-fried blueberry powder too but I do think a lot of the ice creams I see use bilberries rather than blueberries, those are purple all the way through! Although not an ardent fan of ice cream your description is really tempting me to try this. Unsurprisingly I like custard based ones the best. Good point about the purple colour. Haaaa, yes I’m not surprised by that! We bought a ton of blueberries the other day and this looks like the perfect way to use them up. It reminds me of the frozen custard I love in the states. Yes, I really like the no churn recipes too but this one really called for a real custard base, I felt! Oh heavens this looks AMAZING! I have all the ingredients on hand too. Off to pop the ice cream maker into the freezer! If yours comes out more purple I’m going to giggle! 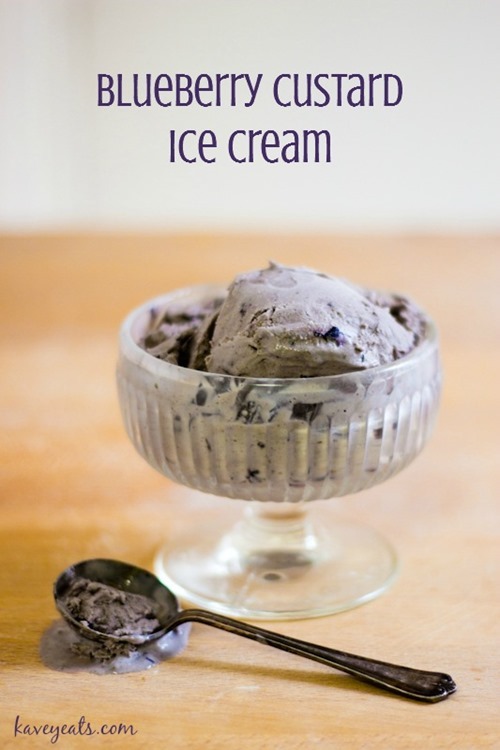 Ice cream with vodka- now that’s my kind of recipe! 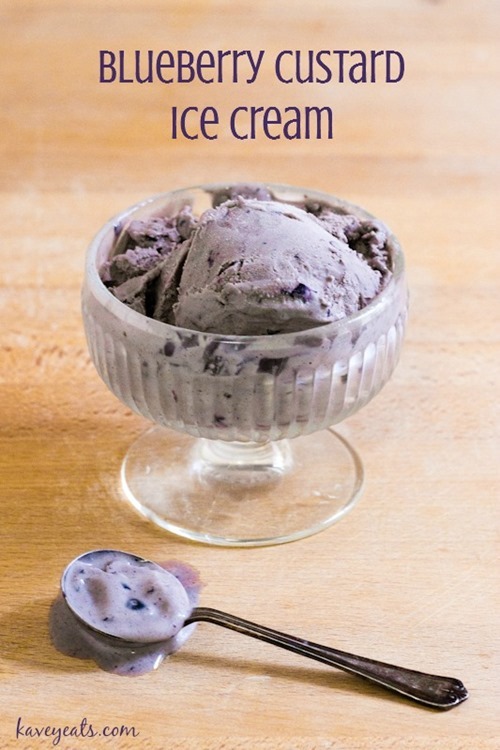 I love blueberries but never thought of making ice cream with them (mostly because they end up in my cocktails). I think you can try using some beetroot juice to intensify the colour further. Beetroot juice is a great natural colourant, you are right. But I love lilac as a colour so I was happy to see how it turned out! And yes, like to get a bit of alcohol in if I can! Love this recipe! I have always wanted to make a custard based ice cream but was afraid of the cooking of the eggs part. I’m excited to hear that you can just do that in a blender! I have a Vitamix so I know it will heat it. Great tip! Yep, this will definitely work in a Vitamix, my friend has one and she’s made custard bases for ice cream in it when we’ve visited. 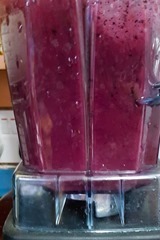 Because it’s being blended at high speed, it looks runnier than cooking in a pan but if you give it 4-5 minutes once heated up (so 6-7 minutes in total for my blender), that should be enough. Mine gets properly steaming hot which definitely cooks the eggs. This looks so good. I love the taste of blueberries and it sounds so perfect in your ice cream. You know me, I like to throw in the alcohol if I can! I agree about summer fruits! Blueberries are one of my favorite. haven’t tried them in ice cream though, need to do that! I really love how the flavour comes through, the first time I’ve used them in ice cream. This looks really good. So glad you don’t use food colorings to achieve a deeper purple. I don’t understand that concept. Give me the real fruit any time. And I love the addition of that vodka. Thanks Mark, yes I prefer to let the natural colours speak for themselves, even though they are subtle. I do think some of the more colourful ones I’ve seen perhaps use bilberries rather than blueberries, but there’s at least one that’s soooo bright I am certain it’s a food colouring job!! Homemade ice cream is always a joy isn’t it? I love the idea of blueberry flavour, and isn’t it a lovely natural colour. Thanks Helen, glad you like the subtle colour, I do too. Yes, love homemade ice cream so much! Ah, the power of photoshop with altering the colour of foods. Your ice cream looks decadent. Don’t think I’ve ever tried that flavour. First stop is to get an ice cream machine first though! I think I’ve seen some that must be food colouring, some that use a different kind of berry that’s full purple inside not just the skin, and some that may well be Photoshop!! I really need to start making custard in my blender. I have the froothie too and have never used it for this purpose but how easy you make it sound. And the vodka stir in. Love that idea. I’ve never heard of doing that before but it’s a great idea and I guess I could do it after I have served the girls. We picked a load of blackberries and raspberries last week and so I might improvise with those this week as it’s supposed to be so hot and for once I have space in the freezer! You can’t taste the alcohol in this one bu whereast you really really can in nectarine maple bourbon ice lollies recently! I love making custard bases in my Froothie, so quick! I’ve never tried making blueberry ice cream before and hadn’t thought about the colour but I think your subtle purple coloured one looks delicious despite not being as vibrantly coloured as some ice creams! In fact, as I have young children I definitely prefer less brightly coloured ice creams as it always drips down their clothes! Hadn’t even thought of the staining aspect, Corina, very good point! Thanks!